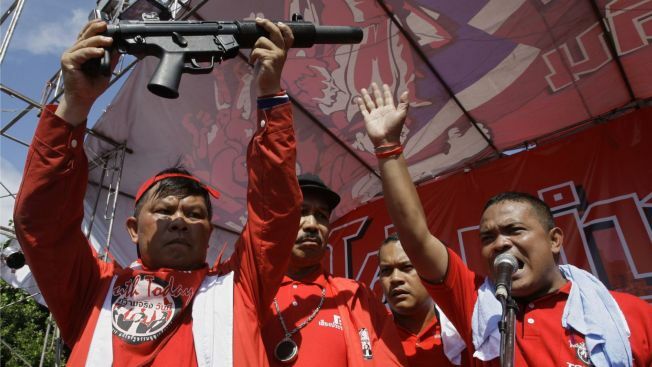 Anti-government protesters and supporters of exiled Prime Minister Thaksin Shinawatra display a gun to symbolize they will defend themselves during a rally outside the government house after the announcement of a state of emergency in Bangkok, Thailand, Sunday. BANGKOK -- Swarms of anti-government protesters attacked the prime minister's car, seized control of major intersections in the capital and commandeered buses, bringing new chaos to the Thai capital as the country's ousted leader threatened to return from exile to lead a revolution. The government declared a state of emergency Sunday but, without the intervention of security forces, it was unclear how any bans could be enforced. In front of the city's biggest luxury mall, demonstrators danced atop two armored personnel carriers they had forced to a stop, waving flags and shouting "Democracy." The red-shirted crowd swarmed around the vehicles and demanded the keys from the unhappy soldiers inside. "Sorry, can't find them," came a muffled reply. The protesters drifted off, and the vehicles left. The uncertain encounter — and others like it across Bangkok, where security forces stood by while protesters ran rampant — reinforced that three years of turmoil between alternating governments and protesters opposed to them seemed ready to peak again. As night fell, demonstrators demanding the resignation of Prime Minister Abhisit Vejjajiva controlled many streets in the city center. Police vans at some intersections were abandoned and looted. Outside the Interior Ministry earlier in the day, a furious mob attacked Abhisit's car with poles, stones and even flower pots as it slowly made its escape. At least six people were injured, including two security guards for the prime minister, and one of Abhisit's top political aides and his driver. Police in riot gear nearby did nothing. Protests were also reported in areas of northern and northeastern Thailand, with one group threatening to blockade the main bridge linking Laos and Thailand across the Mekong River. Ousted Prime Minister Thaksin Shinawatra, regarded by most of the protesters as their leader, called for a revolution and said he might return from overseas exile to lead it. "Now that they have tanks on the streets, it is time for the people to come out in revolution. And when it is necessary, I will come back to the country," he said in a telephoned message broadcast on loudspeakers to followers who surrounded the prime's minister office. Political tensions have simmered since Thaksin was ousted by a military coup in 2006 for alleged corruption and abuse of power. He remains popular for his populist policies in the impoverished countryside, while his opponents — many in urban areas — took to the streets last year to help bring down two pro-Thaksin governments, seizing Bangkok's two airports in November for about a week. The pro-Thaksin demonstrators, calling themselves the United Front for Democracy Against Dictatorship, say Abhisit's four-month-old government took power illegitimately and want new elections. They also accuse the country's elite — the military, judiciary and other unelected officials — of undermining democracy by interfering in politics. The emergency decree bans gatherings of more than five people, forbids news reports considered threatening to public order and allows the government to call up military troops to quell unrest. "The government can't do anything. There are too many of us. We will show them what tens of thousands of unarmed civilians can do. The people will finally rule our beloved Thailand," said Lada Yingmanee, a 37-year-old housewife at one of the protest sites. Army spokesman Col. Sansern Kaewkamnerd said soldiers and police were being moved to more than 50 key points in the city, including bus and railway stations. He said the military presence was not a sign of an imminent coup — a common feature of Thai political history. Abhisit, in an address televised just before midnight Sunday night, called on the public not to panic and to cooperate with the government to end the crisis. Sitting at a meeting table with Cabinet ministers and top military and police officers, he declared that "the military and the police are friends of the people. They do not want to use violence. They are simply enforcing law and order." "In the next three to four days, the government will keep working to return peace and order to the country," he said, without detailing what measures would be employed. Abhisit earlier vowed swift legal action against protesters who stormed the venue of an East Asian Summit in the beach resort of Pattaya on Saturday. Thai authorities had to evacuate the Asian leaders by helicopter. He said five arrest warrants have been issued for leaders of resort protest. A protest leader who spearheaded Saturday's demonstrations, Arisman Pongruengrong, was taken into custody Sunday and flown by helicopter to a military camp for questioning, said police spokesman Maj. Gen. Suport Pansua. Tourism Council of Thailand Chairman Kongkrit Hiranyakit predicted that the country would lose at least 200 billion baht ($5.6 billion) as foreign tourists shunned the country as they did after the airport take-overs. Tourism is Thailand's major foreign currency earner and one they can't afford to ignore as it grapples with the shock of the global economic crisis. At Saturday's summit, more than 1,000 demonstrators broke through a wall of unarmed soldiers, smashed through the convention center's glass doors and ran through the building, blowing horns, waving Thai flags and shouting demands for Abhisit to resign. They declared victory after Abhisit canceled the summit, where leaders of regional powers China, Japan and India, and the U.N. secretary-general and president of the World Bank, planned to discuss the global financial crisis. Analysts say it will now be difficult for Abhisit to regain control — if he is even the one running the country. "It remains to the seen if the security forces can control the situation. It is unlikely anyone can because there are so many splits and so many power brokers," said Charnvit Kasetsiri, one of Thailand's most prominent historians. "No one seems to be in charge within the establishment, the government and the military."